Home / Archive by Category "Gardens"
We are excited to announce the 2019 mini-grant program from Vital Communities’ Upper Valley Farm to School Network! Funding is available to both Vermont and New Hampshire schools. Start dreaming up your farm-to-school projects—we want to support you! Mini-grants are designed to help your school, afterschool program, or school-related wellness program launch projects related to farms, our agricultural heritage, farm products, food production, or local food consumption at the school itself. A broad range of projects have received funding in recent years including field trips to local farms, food from a local farm, materials for gardens and garden activities, and stipends for farmers, teachers, or FTS coordinators. Funds could also be used in the cafeteria to pay for training, supplies, or equipment. The maximum mini-grant award is $500. Both New Hampshire and Vermont schools are eligible to apply for funds. Recipients in both states are required to present their project at Trek to Taste in Woodstock, Vermont, on June 1, 2019 (in addition to other grant requirements). We encourage schools to include costs related to project presentations and attending Trek to Taste in their grant budget. For additional information on eligibility, the application process, and possible projects, please see our online application form, download a printable form, or contact Beth (802.291.9100 x105). The Upper Valley Farm to School mini-grant program is made possible thanks to the Couch Family Foundation, the National Park Service, and the Wellborn Ecology Fund. Upper Valley Farm to School 2018 Mini-Grants! I am so excited to announce the 2018 mini-grant program at Upper Valley Farm to School! We have funding focused on both Vermont and New Hampshire schools. Start dreaming up your farm-to-school projects – we want to support you! A broad range of projects have received funding in recent years including field trips to local farms, food from a local farm, materials for gardens and garden activities, and stipends for farmers, teachers, or FTS coordinators. Funds could also be used in the cafeteria, to pay for training, supplies, or equipment. NEW FOR 2018: The maximum mini-grant award is now $500. Both New Hampshire and Vermont schools are eligible to apply for funds. Recipients in both states are required to present their project at Trek to Taste on June 2, 2018 (in addition to other grant requirements, below). We encourage schools to include costs related to project presentations and attending Trek to Taste in their grant budget. For additional information on eligibility, the application process, and possible projects, please go to our on-line application form, download a form or, contact me. We ended the school year with various classes “adopting” raised “laboratory” beds, perennial, and permaculture gardens around the school. Within these we have a team of students that planted a garden committed to serving our salad bar and lunch programs, another few classes creating food for storage for cooking/baking projects, a class that planted a butterfly garden- with an off-site milkweed patch to promote monarch habitat, and yet another team of classes planted a “stone soup” garden. We received funding for a staff member to tend the gardens over the summer months- always a hiccup in the process of gardening at school. Over time, our school has become increasingly committed to using farm to school curricula to support student learning and engagement. We also purchased a beautiful new greenhouse kit and will put together a group of staff and community members to erect it so it can begin to be used once school is back in session. Finally, we’re really excited that we’re sending a team consisting of administrator, parent, chef, and teachers to the three-day Farm to School Institute at Shelburne Farms! After completing two farm to school grants, our team is poised to create a plan that will allow our program to continue to grow and become sustainable. We feel very fortunate! In the winter of 2015-2016 it was brought to my attention that Canaan Elementary School would support the creation of a food garden. I was allowed to work with second and fourth graders to create this garden so that they could learn (first hand) how to plan a garden, use organic methods, and enjoy the fruits (and vegetables) of their labor. Another goal was to educate them on making healthy food choices. 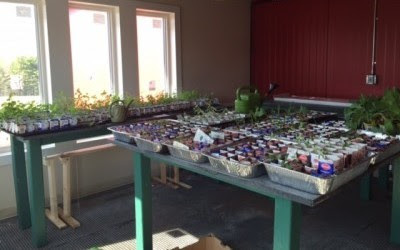 The students began planting seeds indoors in early March under grow lights. 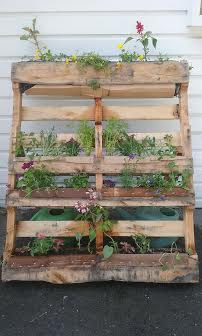 They tended the seedlings throughout the spring, planned how to build the raised beds, set cardboard down on the walkways, mulched the walkways, built the raised beds, filled them with compost and soil, transplanted seedlings, and sowed seeds directly. They learned that straw mulch retains soil moisture and mulched the beds as well. They have been weeding, watering, observing, and even harvesting some salad greens. Students made sketches about how to direct rain water from our outdoor classroom roof (which is next to the garden) into a water collection barrel. The rain collection system is currently under construction. Our school will host a summer recreation program and the staff has agreed to have the students tend the garden throughout the summer. Each day the cafeteria will prepare two meals and include what the children harvest. Students have been very enthusiastic about this project and have enjoyed accomplishing a lot of work in a short time. I made this colorful crunchy salad on the fly on Memorial Day when the grocery stores were closed for the holiday and my parents, siblings, and out-of-town cousin were on their way over for dinner. I wanted a salad but only had asparagus, broccolini, scallions, and radishes from Cedar Circle Farm plus a few carrots in the fridge and herbs in the garden. And thus this salad put itself together with a little thoughtful slicing and a lemon dressing. Thoughtful slicing? By that I mean thinking about the best way to slice each vegetable to make the salad both beautiful AND to make each bite make sense in your mouth. For example, radishes are pungent and spicy, so I sliced some of them into paper-thin rounds and the rest into thin wedges – both shapes ensure a huge chunk of radish won’t ruin a bite. Similarly, raw carrots are great, but I don’t love them shredded and neither do I want huge carrot sticks. So I cut them in thin irregular slices on the diagonal that are easy to pick up with a fork without too much crunching and drama. I prefer my broccoli cooked, so I did that before slicing it into long strips. You get the idea. Give each vegetable a moment of thought to optimize its good qualities and make it pretty and easy to eat. Mix up colors and flavors, shapes and textures. This salad can be made with any spring vegetable you like eating. Keep a vegetable raw if it tastes good raw (like scallions, kholrabi, peas, and radishes). Briefly steam, saute, or roast it if it’s better cooked (like broccoli, fiddleheads, or bok choy) and then cool before adding. Don’t forget the fresh herbs! I mixed dill, cilantro, basil, and marjoram, all from my backyard. In my opinion, any combination of fresh herbs is good in a salad. a handful of fresh herbs – basil, cilantro, parsley, marjoram, dill, chives, etc. Mix everything together in a salad bowl with a little salt (these vegetable chunks will soak up more salt than a plain salad of greens, so don’t be shy with the salt). Whisk this all together until smooth and creamy. Toss with the salad and serve immediately. – delicious juicy hamburgers with beef from Back Beyond Farm in Chelsea, Vermont, covered in fried onions and spicy sauerkraut. – Vermont ice cream with chocolate sauce. **Thank you to my brother Ben for the photos.